A population’s niche refers to its role in its ecosystem. It is the relationship of a population and its ecosystem to each other. The niche concept was investigated in the 1930s by Georgy Gause. Niche means the feeding habits in a food chain. A niche has a producer, consumer, predator, parasite, leaf-eater, etc., but just which organisms play those roles is what makes each niches unique. Each niche has its own chain of organisms. The food, habitat, and reproduction methods also explain the niche in detail. The interactions between populations can be identified if different niches of an ecosystem are identified. The same niche will be adapted by same population members. For example, long thin beaks of nectar feeding birds allow them to consume nectar from flowering plants and they in turn pollinate the plants. This relationship is typical of a niche. • Species with narrow niches. • Found in tropics with abundant & stable habitats. • Lead to low diversity. Georgy Gause used flasks of different species of the protozoan Paramecium, which eats bacteria. Two different results (given below) have been obtained. 1. When two species of Paramecium share the same niche they start competing with each other and the faster-growing competes over the other. 2. 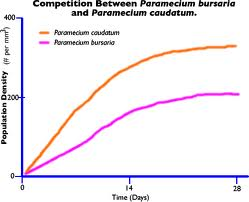 Since the two species of Paramecium are slightly different with their niches there was no need for them to compete and they appeared together. Competitive exclusion principle: Two species cannot coexist in the same habitat if they have the same niche. Lets expand the principle as follows: “If two different organisms are living in the same habitat can survive freely if they belong to different niches only because there will be no need for them to compete with each other for food and survival. Want to know more details about Niches? Click here to schedule a live help with an eTutor!